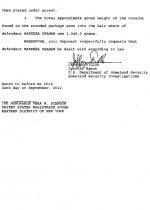 SEPTEMBER 26--The suspiciously towering hairdos of two women who had just flown into New York City from South America prompted federal agents to conduct searches that revealed each traveler was carrying more than two pounds of cocaine sewn into her weave, according to court records. After arriving early Sunday morning on a flight from Guyana to John F. Kennedy International Airport, the women appeared fidgety and extremely nervous during routine questioning by Customs and Border Protection (CBP) agents. 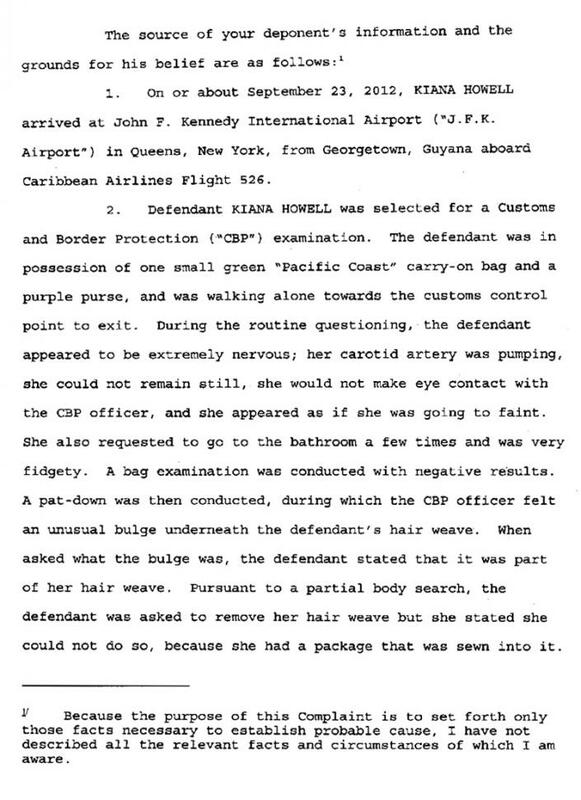 In a U.S. District Court affidavit, a federal agent noted that Kiana Howell "appeared as if she was going to faint" and "her carotid artery was pumping." 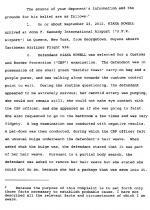 During a pat-down, an investigator felt "an unusual bulge beneath the defendant’s hair weave." 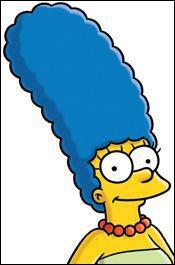 When asked about the bulge, Howell claimed that it was "part of her hair weave." When asked to remove the weave, Howell said that she could not "because she had a package that was sewn into it." 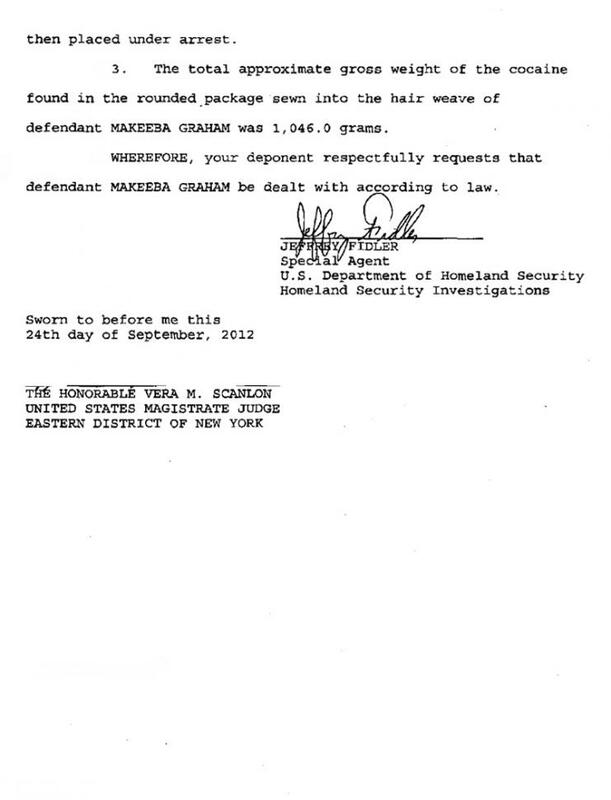 Howell stated that her boyfriend in Guyana "told her to bring that package under her hair weave to the United States for him." 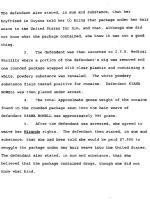 While claiming that she did not know the package's contents, Howell admitted, "it was not a good thing." Howell's weave was subsequently dismantled at a medical facility, where agents removed a rounded package wrapped with clear plastic. Inside was nearly a kilo of cocaine. 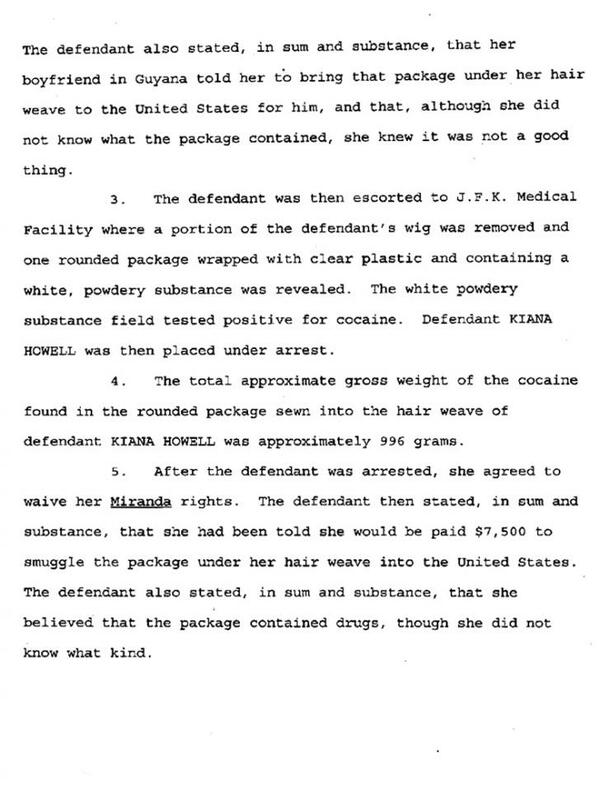 After Howell's arrest, she told investigators she had been promised $7500 to "smuggle the package under her hair weave." 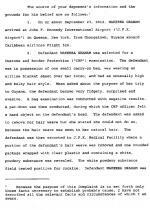 The second traveler, Makeeba Graham, "had an unusually high and bulky hair style," according to an affidavit sworn by Department of Homeland Security Agent Jeffrey Fidler. 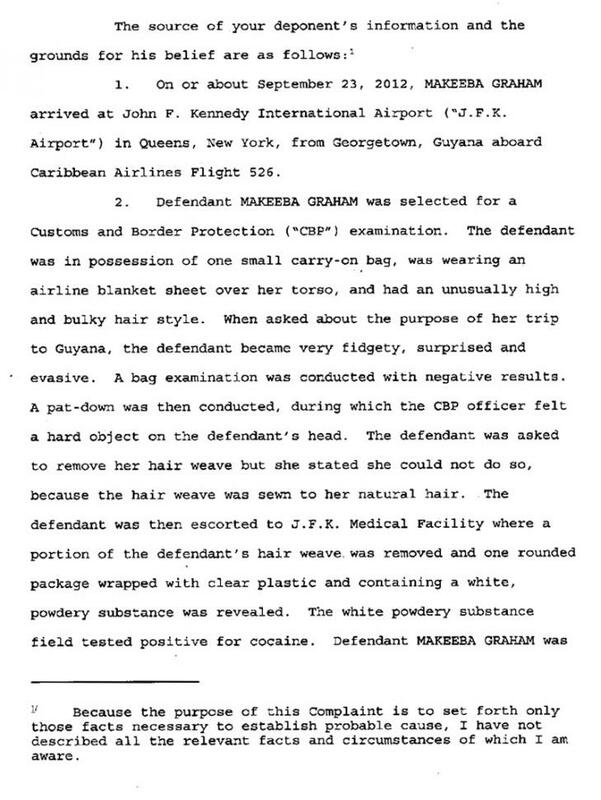 After a CBP agent "felt a hard object on the defendant’s head," Graham, a 33-year-old Harlem resident, was "asked to remove her hair weave." After Graham claimed that she could not remove the weave because it "was sewn to her natural hair," she was transported to a medical facility where the weave was partially dismantled. Inside, agents discovered a rounded package containing more than a kilo of cocaine.